The finding at a site called Ceibal suggests that the origins of the Maya civilization are more complex than first believed. Archaeologists hotly debate whether the Maya – famous for their complex calendar system that spurred apocalypse rumors last year – developed independently or whether they were largely inspired by an earlier culture known as the Olmec. The new research suggests the answer is neither. “It’s signaling to us that the Maya were not receiving this sophisticated stuff 500 years later from somebody else, but much of the innovation we’re seeing out of the whole region may be coming out of Ceibal or a place like Ceibal,” said Walter Witschey, an anthropologist at Longwood University in Virginia, who was not involved in the study. 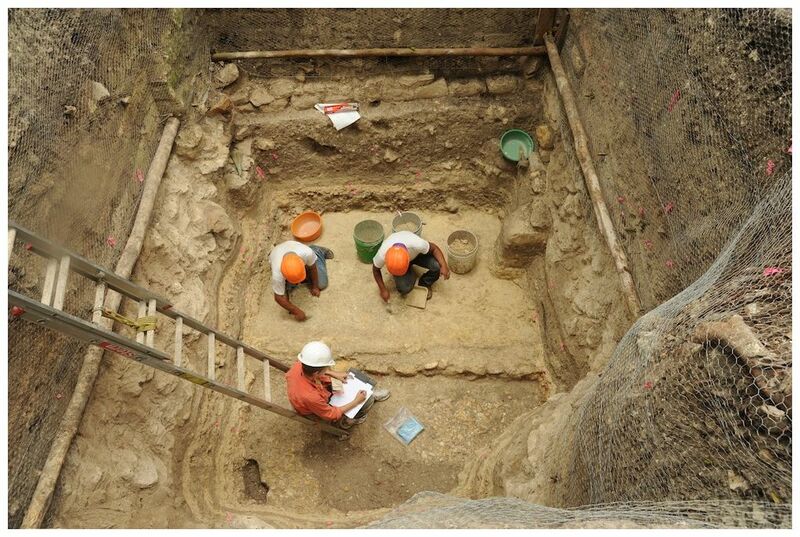 Archaeologists uncover some of the earliest residences in Ceibal. The oldest layers of the city were buried under 23 to 60 feet (7 to 18 meters) of dirt and later construction. 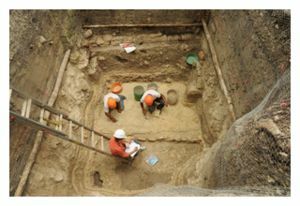 The finding comes from seven years of archaeological excavations at Ceibal, a site in central Guatemala that was occupied continuously for 2,000 years. Getting to Ceibal’s origins was no small feat: The earliest buildings were buried under 23 to 60 feet (7 to 18 meters) of sediment and later construction, said study co-researcher Daniela Triadan, also a University of Arizona anthropologist. The earliest structures recently discovered include a plaza with a western building and an eastern platform, a pattern seen at later Maya sites and also at the Olmec center of La Venta on the Gulf Coast of what is now Mexico. The researchers used radiocarbon dating to peg the date of construction to about 1000 B.C. This technique analyzes organic materials for carbon-14, an isotope or variation of carbon that decays predictably. As such, carbon-14 acts as a chemical clock archaeologists can use to figure out how long something has been in the ground. A construction date of 1000 B.C. makes the Ceibal structures about 200 years older than those at La Venta, meaning the Olmec’s construction practices couldn’t have inspired the Mayans, the researchers report Thursday (April 25) in the journal Science. Instead, it appears that the entire region underwent a shift around this time, with groups adopting each other’s architecture and rituals, modifying them and inventing new additions. “We are saying there was this connection with various groups, but we are saying it was probably not one directional influence,” Inomata said. There was an earlier Olmec center, San Lorenzo, which declined around 1150 B.C., but residents there did not build these distinctive ceremonial structures. By 850 B.C. or 800 B.C., the Maya at Ceibal had renovated their platform into a pyramid, which they continued refining until it reached a height of about 20 to 26 feet (6 to 8 m) by 700 B.C. This early phase of Maya culture occurs before the group developed written language and before any record of their elaborate calendar system, so little is known about their beliefs, Inomata said. But the pyramid-and-plaza area was almost certainly a space for rituals. Among the artifacts found in the plaza are numerous greenstone axes, which seem to have been put there as offerings. The architecture layout is what’s known as a “group-E assemblage,” said Witschey. These assemblages appear all over the Maya world and worked as solar observatories. From the western building, a view could stand and look at the eastern platform or pyramid, which would have posts at each end and at the center. On the summer solstice, the sunrise would occur over the northernmost marker; on the spring and fall equinoxes, it would be right over the center marker; and finally, on the winter solstice, the sun would rise over the southernmost marker, Witschey said. It’s not clear what might have prompted the lowland Maya to give up their semi-settled life for permanent villages and cities, Inomata said. One possibility is that maize production became more efficient around 1000 B.C. The coastal Olmec people had long been able to grow maize reasonably well, given fertile soil from rivers feeding into the Gulf of Mexico. But the Maya lowlands were less wet and less fertile, with fewer fish and fowl that the Olmec could have depended on to round out their diets. If maize farming became more productive around 1000 B.C., however, it may have prompted the Maya to start staying put. “At that point, it probably made sense to cut down many forest trees in the Maya lowlands and then commit more strongly to an agricultural way of life,” Inomata said. Members of the research team are currently working on environmental analysis to try to better understand the climate and weather of the area around the time of settlement. What does seem clear, Inomata said, is that Maya civilization didn’t have to arise from an earlier, failing civilization. What the Maya findings suggest is that a new civilization doesn’t have to arise from the dust of a previous one, but can happen through the interaction of multiple groups trading ideas, Inomata said. “What they’re reminding us is how much the jungle still hides, how much more there is to learn and how complex a story of the evolution of this civilization we really have on our hands,” Witschey said.